In Eugene, the Whoville tent camp has returned, this time to city-owned land next to a downtown street. 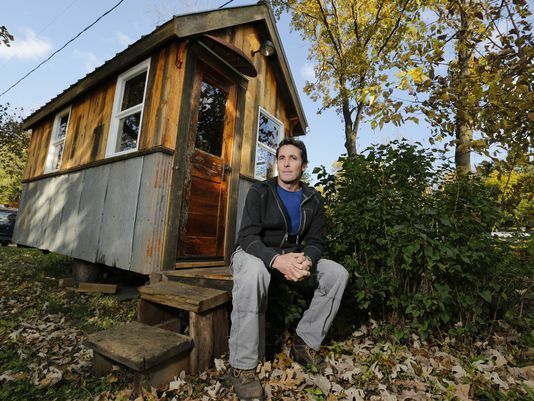 Eugene urban planner Andrew Heben has an alternative idea to tents: tiny houses. 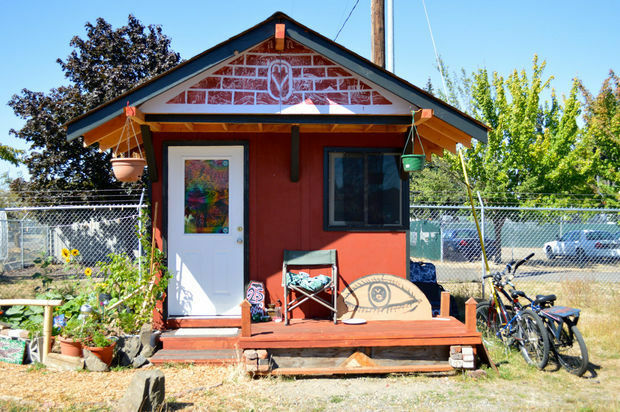 The author of Tent City Urbanism: From Self-Organized Camps to Tiny House Villages (The Village Collaborative, $18) co-founded the nonprofit organization Opportunity Village Eugene, which last year created a community where people live in 30 tiny houses. 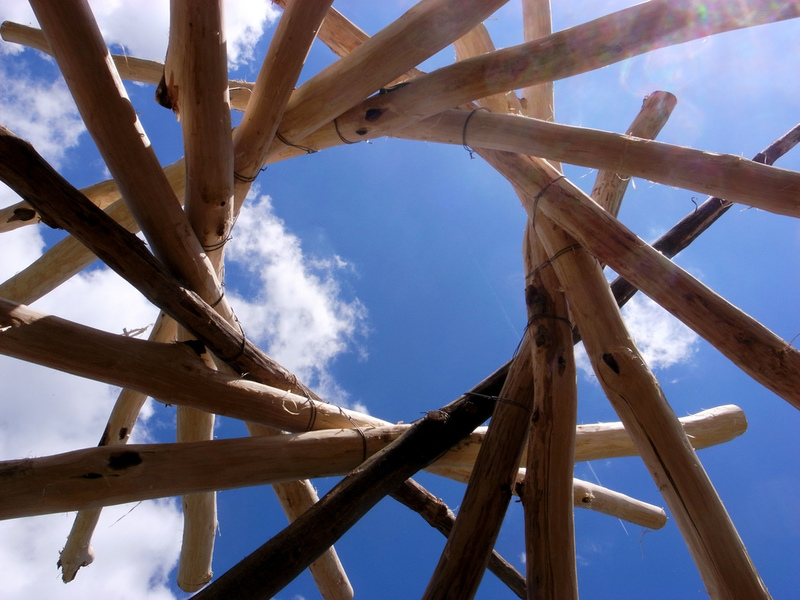 There is no electricity or plumbing, but the front doors can be locked for privacy and the modular, simple structures keep the rain, wind and chill away. A tenant can personalize the 80-square-feet space. Many have sleeping lofts over the kitchen/desk area. A few have painted the plywood walls. 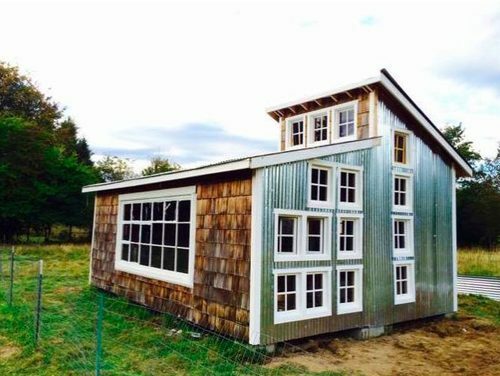 “Take a 1901 barn, a 1923 farmhouse, and a student who needs an architectural project and you get the opportunity to own a unique two-piece tiny house. 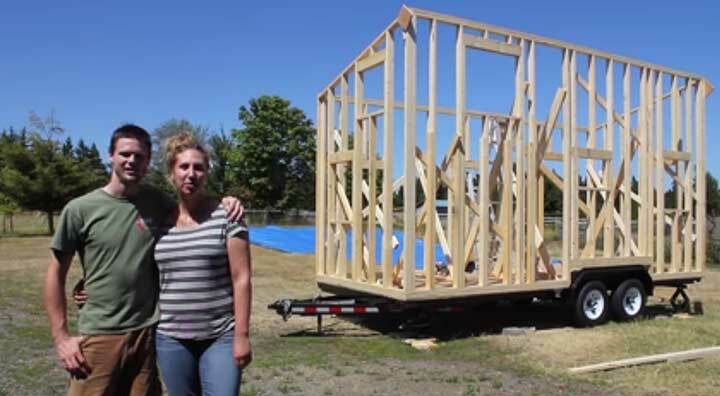 Come up with $23,000 and a way to move the project from its home in Olympia and you support a student with ideas while also being green and eco. 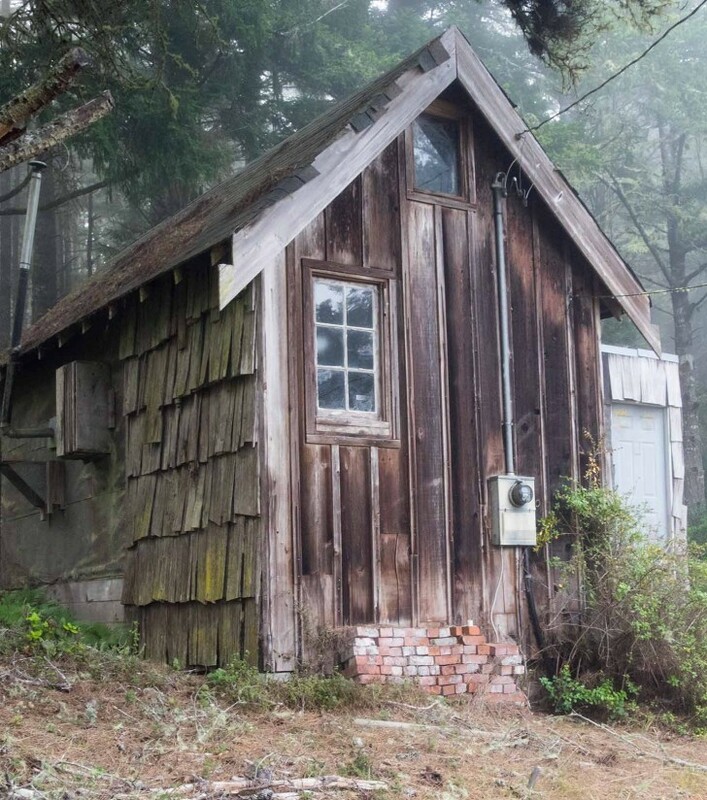 At 256 square feet, the price per square foot isn’t too bad, either. There must be a catch. 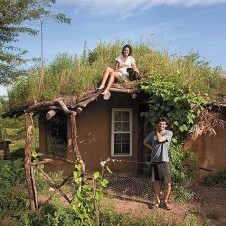 Unique, off-grid, tiny home located on a 46-acre agro-forestry farm. 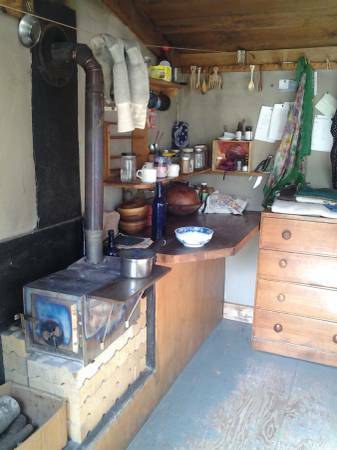 Each beautiful, one-room cabin has a wood stove, built-in double bed, writing desk and personal kitchen within its small footprint. 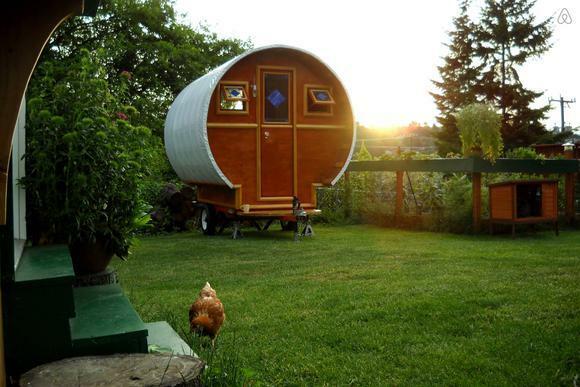 Although tiny, each cabin is self-contained and has sufficient storage. 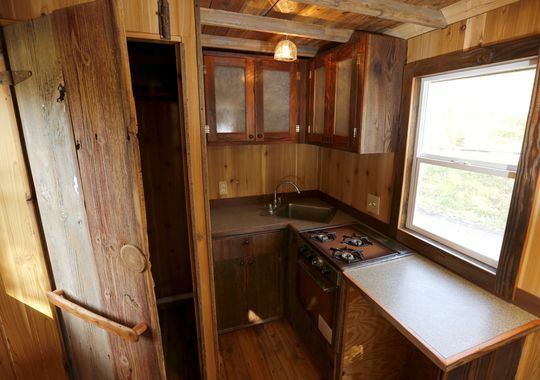 The kitchen is equipped with a propane stove-top, open shelving and a counter-top water dispenser. Deek is the artist/author of Humble Homes, Simple Shacks, Cozy Cottages, Ramshackle Retreats, Funky Forts: And Whatever the Heck Else We Could Squeeze In Here, prolific designer, builder, video maker, media prankster, musician, and has been featured in our books Tiny Homes as well as Tiny Homes on the Move. 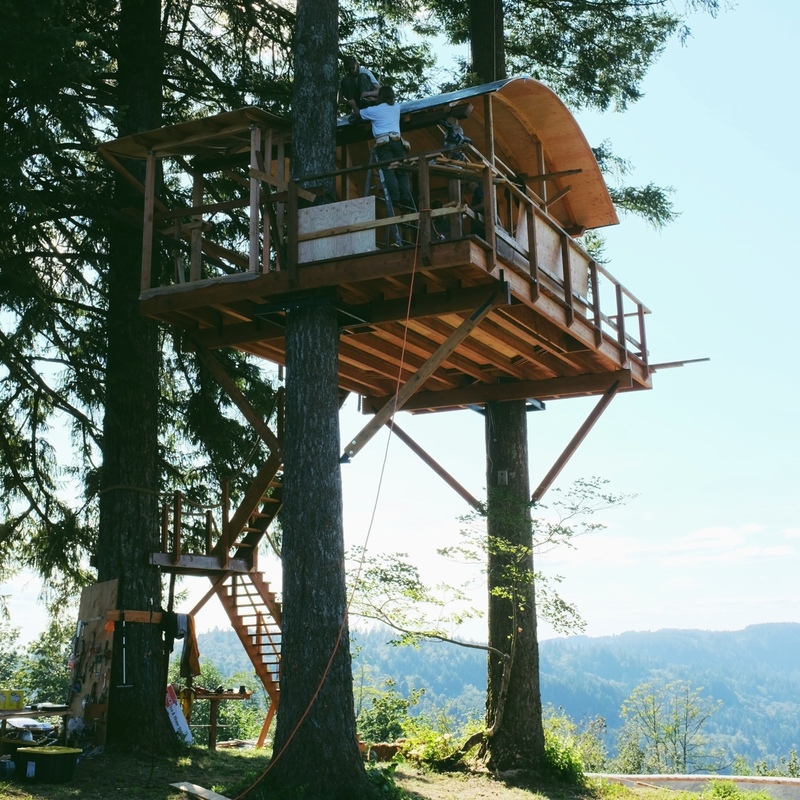 Luke Iseman and Heather Stewart were tired of paying San Francisco rents and had always dreaming of living in a shipping container so for less than one month’s rent they bought a used shipping container ($2,300 from the Port of Oakland) and began to convert it into a home. 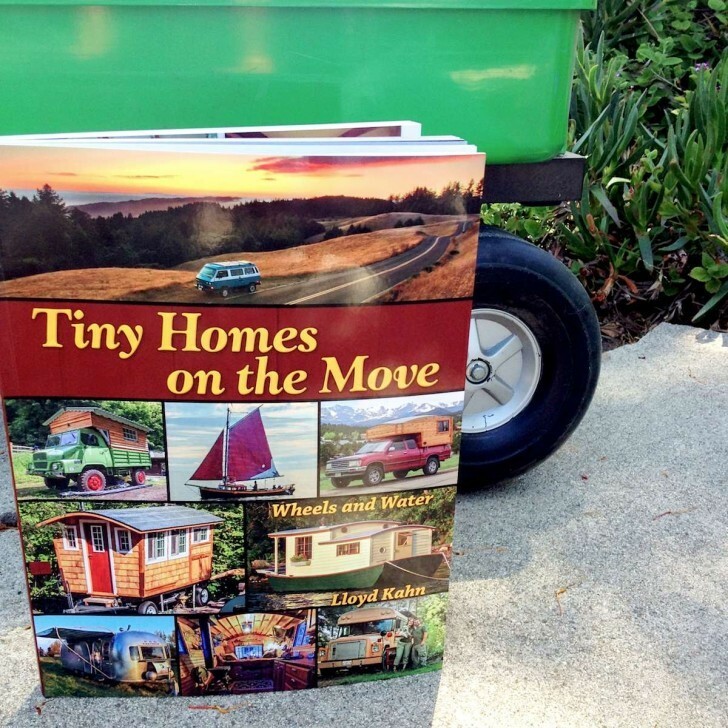 In Tiny Homes, we did two pages (pp. 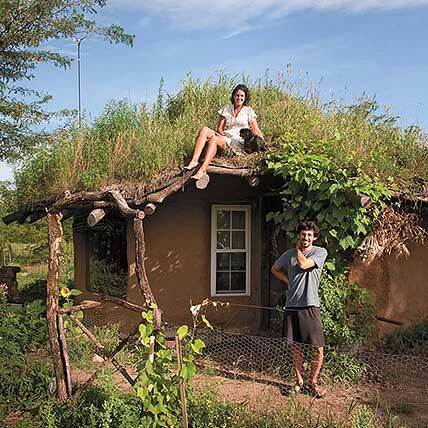 110-111) on Ziggy Liloia’s cob cottage. In this excerpt from his website, TheYearOfMud.com, he explains how he built his reciprocal framed roof. They printed 8 photos from the book in conjunction with Lloyd’s appearance in Vancouver this Monday night (www.vpl.ca/calendar/index.php/calendar/progid/48441). 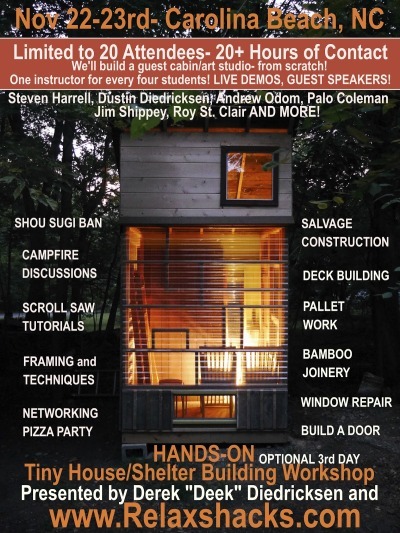 Foster Huntington’s 6-speed 6 cylinder Toyota 4×4 pickup truck camper is featured in Tiny Homes on the Move (pp. 22-23). 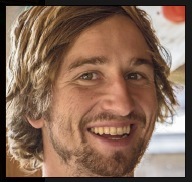 He stopped by our studio on his way north from Baja last year and we shot photos for the book. 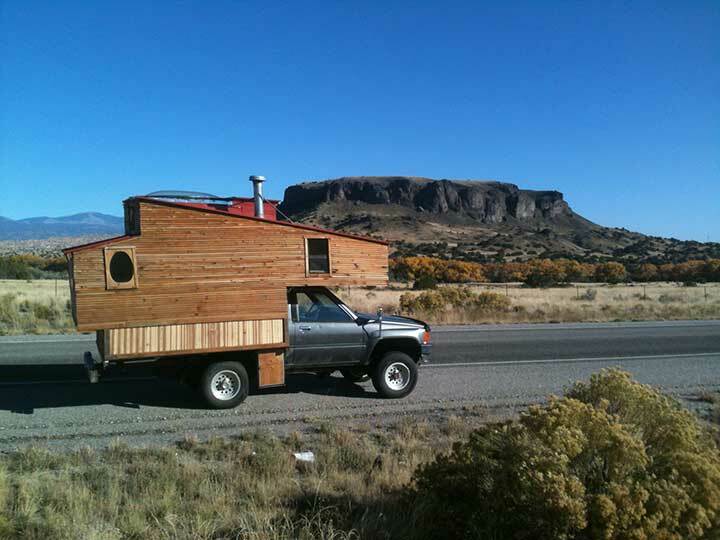 It’s an beautiful rig, the best I’ve ever seen for off-road/surfing travel. 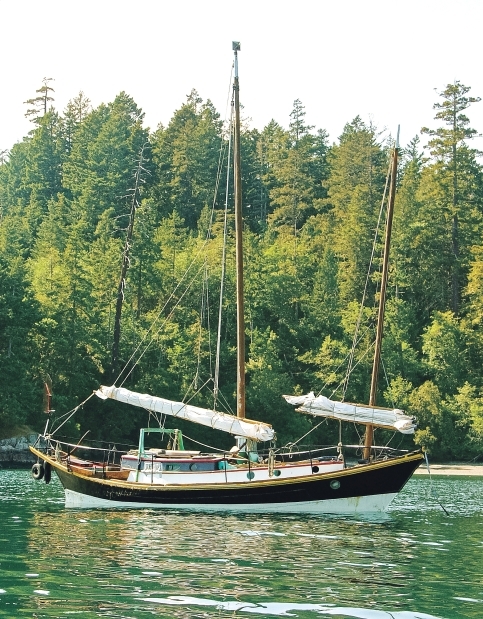 He was heading up the coast, looking for new adventures. Check out Foster and friends building, skating, jumping into waterfalls, hot-tubbing. Are these guys having fun? I wanna be there! (and 40 years younger). 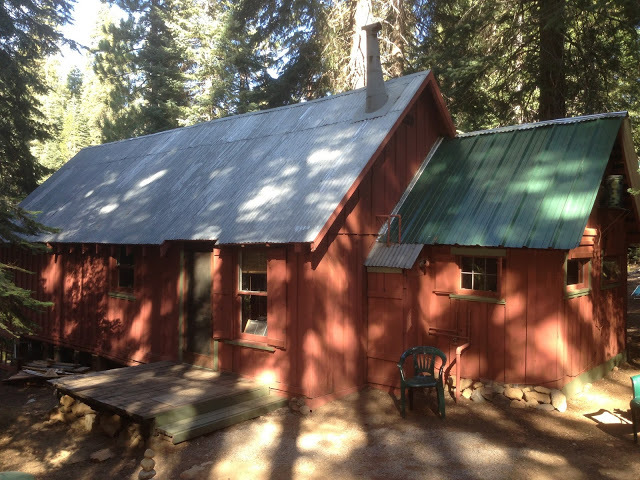 I wanted to send this link along, in case you wanted to share it with your blog readers — it’s a series of pictures of a three-room 1930s Forest Service Cabin in Northern California, along the Feather River up near the Lassen National Park’s volcanos. 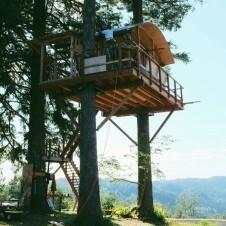 Wonderful spot — propane lights, gravity feed water, and lots of trees. Keep up the great work! We’ve got all your books, and can’t wait for the next. Really enjoyed hearing you talk in Santa Cruz, not so long ago.